Kathie (not her real name) is a mother of four, three of whom she was still supporting financially while living in a three-bedroom apartment with her ex-husband and his father. She had a criminal record, which she attributed to living in poverty and having a drug addiction. The principal on her legal financial obligations (LFOs) was $11,000, but after years of making minimum monthly payments, she owed $20,000 — thanks to state-imposed interest at 12 percent, annual collection surcharges and private collection fees. By the time he was 38, Nick (not his real name) had accumulated $3,178 in LFOs. Dealing with drug addiction and mental health problems, he’d served several prison sentences, as well as stints in county jail due to lack of payments made on his LFOs. Vilma (also not her real name), a 30-something mother of three, had been both a victim and a defendant in a domestic violence case. On top of serving eight years in prison for assault, she was assessed $33,000 in LFOs. Despite working in a construction apprenticeship program and making regular minimum monthly payments, 13 years after her conviction she still owed $72,000. 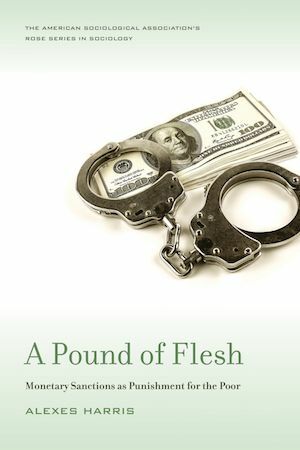 These were just some of the 55 individuals Alexes Harris and her colleagues interviewed in the course of compiling research for A Pound of Flesh: Monetary Sanctions as Punishment for the Poor, released Wednesday. Among the 55 interviewees, the average LFO debt was $9,204, including restitution to victims, fines, fees for public defenders or time spent in jail or filing fees, surcharges calculated as a percentage of the LFO and other charges. Of those who said they made monthly payments, the average payment was $31.25 per month. Washington State, where the book focuses most attention, charges 12 percent interest and an annual $100 collection fee on LFOs. The research team also interviewed more than 100 state and court officials, including clerks, judges and attorneys in Washington State. Harris observed over 120 courtroom interactions, including trials and sentencing hearings, in five counties across the state. The variation in judicial practices around LFOs was a surprise to Harris and her team. Washington State imposes $600 in mandatory minimum fines for each felony conviction, but beyond that, state laws list many sanctions that “may be” assessed. Other court officials tended to feel that regardless of who the defendants were, or what they had experienced — mental illness, homelessness, unemployment — they had to take personal responsibility for their actions, and saw the monetary sanctions as a system of accountability. According to the team’s research, Washington’s statewide average LFO upon sentencing is $1,300. “It surprised us, the extent to which people who were clearly unemployed, homeless or on disability were expected to make payments,” Harris adds. The demographics of who shoulders that burden is no surprise, however. “People of color disproportionately make contact with the criminal justice system and therefore, they disproportionately receive the burden of the fines and fees,” Harris says. It wasn’t always this way. In the 1990s and early 2000s, “there was a proliferation of the types of fines and fees that could be assessed to individuals, and then a broadening of the amount,” Harris says. She argues that fines and fees increased over time because jurisdictions are trying to figure out how to manage their criminal justice budgets. But, she also argues, it’s not paying off the way counties would like. It’s not realistic to expect someone coming out of prison, trying to get themselves back on their feet, to really pay off all the debt that the judicial system is issuing. “In the face of all the negative consequences, the small amount of money that’s generated from imposing a larger and larger amount of debt — three-quarters of a billion dollars of debt in one county where the average payment is $39 a year — it does not make sense to generate the money that’s being generated,” Harris explains. To cap it all off, another surprise has been the lack of transparency and data on this issue, period. While it’s easy to find statutes, like the fact that two-thirds of states allow judges to charge defendants a fee for the use of a public defender, it’s basically impossible to find data on how often and how severely such fees are being imposed. The Washington State judicial system itself, through its Minority and Justice Commission, funded Harris’ initial research because it had no idea about the frequency and severity of LFOs imposed on people coming through the courts. The Laura and John Arnold Foundation is now founding Harris and her team at the University of Washington to gather research on LFOs from seven other states. “I think it’s a bit ironic that the so-called experts, the criminologists, sociologists, that we knew nothing about LFOs or legal financial obligations,” Harris says. “But whenever I go and to talk to attorneys or people who have been convicted, they know exactly what an LFO is and they know exactly how much money they owe.” If they had multiple convictions in different counties, inmates and returning citizens Harris interviewed even knew which counties were more strict about on-time payments than others, and thus which to pay first. “It’s been a really interesting reaction across the board, and I’m just hoping that more and more people who learn about this can recognize that this system is being done in our name and that we’re responsible for what’s being done,” Harris adds.